Storing food is a great way to save money and ensure a ready supply of food in cases of emergency. Most people stock up on canned goods and processed foods because of their long shelf life and lack of preparation needed to store them. Dehydrating is a great way of preserving fresh foods while adding something tasty and nutritious to your food stocks. If you’re looking for a quick and easy way to dehydrate your vegetables, jerky, or fruits, you might want to take a look at the Nesco FD-75A Food Dehydrator. You no longer have to wait days to dehydrate your fruits and vegetables. With the Nesco Dehydrator you can prepare most of your food in just 8 to 12 hours. 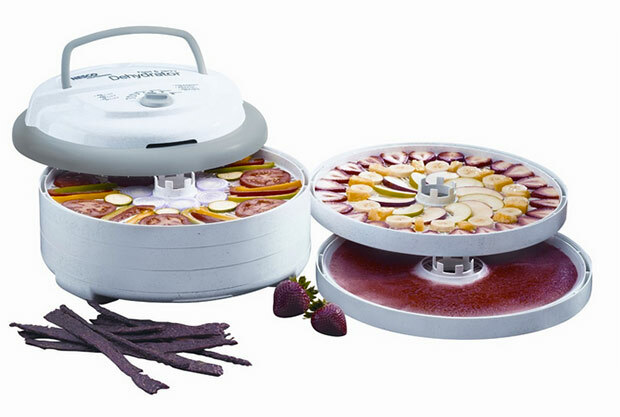 The Nesco uses a patented flow drying system that uses a top mounted fan for fast even drying and makes it possible to dehydrate different foods at the same time without mixing flavors. The top mounted fan avoids any spilling into the heating chamber and is great for keeping things clean and easy to maintain. The Nesco dehydrator also has an adjustable thermostat that ranges from 95 to 160 degrees for easy temperature control making it great for drying a wide variety of foods. The unit comes with five trays and can be expanded to 12 for drying larger quantities. It also comes with a recipe book with 52 pages of easy to make meals as well as some jerky spices to get you started.